This year at Passenger Terminal Expo in Stockholm Materna will demonstrate the whole passenger journey on the ground in Virtual Reality. Visitors are invited to explore how the passenger moves from check-in to boarding seamlessly by using the automated solutions from the global industry leader. No matter if the airport uses one-or two-step processes for self-baggage drop-off, Materna provides quick and easy retrofit systems as well as greenfield solutions like their flagship product family “Air.Go”. All those can be experienced with the Virtual Reality technology. Visitors learn how the solutions differ in usability and flexibility. 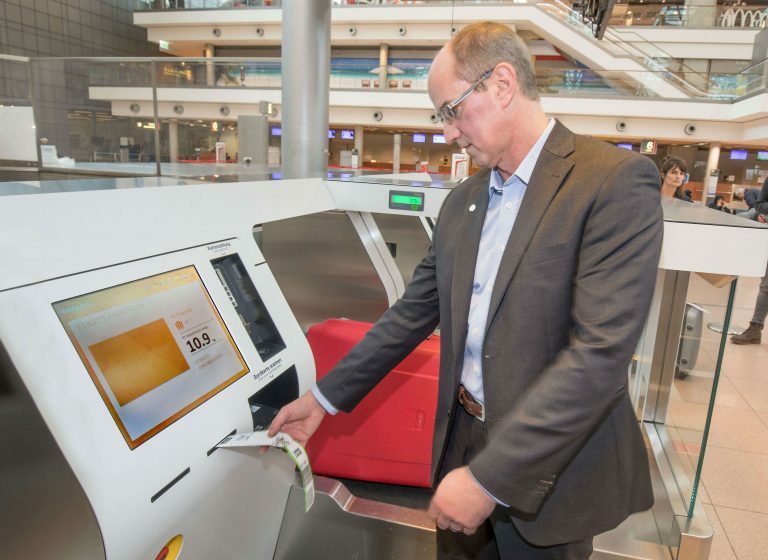 The virtual journey includes also the check-in process at Materna´s brand new kiosk with facial recognition through to the self-boarding gate. The benefit for the expo visitors from airports and airlines is fantastic: They will get an impression how the individual solution will fit into the terminal design and infrastructure. This Virtual Reality service is also customizable for any of the Materna solutions for a special airport. Visitors arriving at and departing from Stockholm-Arlanda Airport will experience solutions from Materna at certain touch-points. Swedavia, Sweden´s Airport Operator is one of Materna´s most important customers and provides over 150 check-in kiosks and 130 retrofit self-bag drop units to passengers. Also live at the stand: Visitors may also experience most of the Materna products live at stand No. 1100. The brand new Pax.Go kiosk will be launched at PTE in Stockholm for the first time and will provide both check-in and self bag drop. This kiosk is developed for international markets. The new Drop.Go solution with only 8 kg is the smallest Self Bag Drop version and can be mounted easily on existing check-in desks for a quick and easy self bag drop. This retrofit version is already in use at Copenhagen and Quebec Airport successfully. Passengers use the intuitive touch display, just scan the bag tag and their luggage is ready to go. Biometric identification at different touch points is an option for integration into Materna´s solution. Visitors will experience some of these options at PTE in Stockholm.